From my karate training over the years, I have learnt to be punctual, with the senior instructors at karate if you are five minutes early, then you are late. As an instructor I like to start on time with a full class, it gets a little annoying when people come in late, so I make it a priority to be early, even to the point that I have been known to set my watch five minutes fast, then if I am rushing and glance at my watch I see incorrect time, then if I make it on time, I’m still early. So yesterday morning I was on team, so as usual I like to be at Church around 9am to get the camera set up before everyone comes in for huddle, I set off from home with my daughter in plenty of time to be there well before huddle at 9.15am. 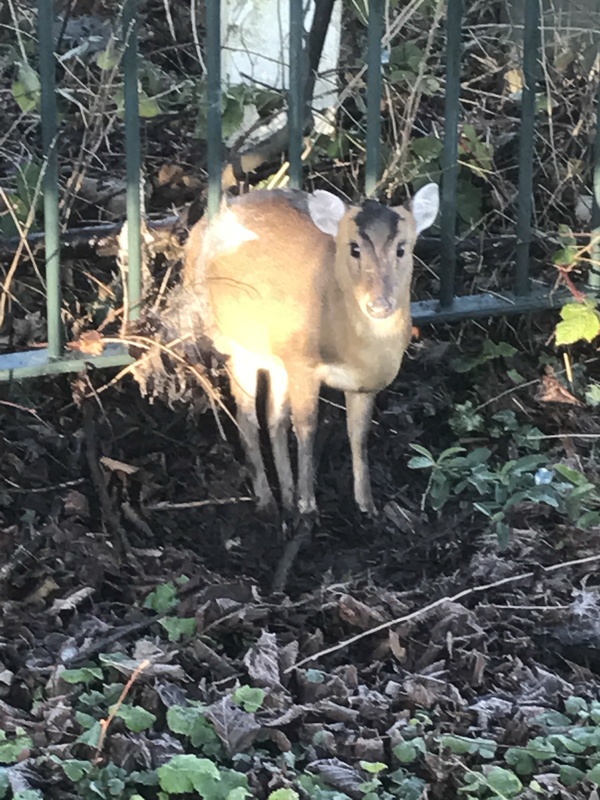 We got with five minutes of Church when we heard a noise in the undergrowth at the side of the road we were on, when we looked down there was a small deer trapped in the railings to a factory. The poor thing was in distress, trying to get free, I’ve never heard a deer squeal before, but I can safely say it’s not pleasant to hear. I crossed over the small fencing to the side of the pavement and went down to where it was, I tried to open up the bars, but couldn’t. It was only a young deer, it had got it head and front legs through the bars, it even had the back legs through, but the hips were jammed in the bars. It tried to wriggle and work itself out, but it couldn’t do it. The grown was frozen, it was barely over freezing, the bars must have been cold as they had taken fur from the deer’s back where she had reared up against them, there were two patches of raw skin either side of it’s spine. I rang the RSPCA (Royal Society for the Prevention of Cruelty to Animals) to report the animal, they are responsible for injured animals in the U.K. They took down all the details and the location, they asked if I was willing to monitor the animal until someone could get there, to which I agreed, there was no way I was leaving the animal until I knew it was safe. As I made the call a friend from Church came past us, my daughter was getting upset seeing the animal trapped, in pain and squealing, so she went with Jo to Church whilst I waited. A local named Pete came by whilst walking his dog, he wondered why I was just stood there in the undergrowth of a largely deserted road, I showed him the little deer and he said he would take his dog for it’s walk, then take it home and come back, if no one had arrived he would wait until they did so I could go to Church. From time to time the deer would try to free itself and would thrash around while squealing, if I spoke to it, telling it to calm down it seemed to respond to my voice and stop, settling down for a while, then it would just look at me and I felt helpless. I waited about an hour, Pete came back first and stood with me, then Jo came back with a cup of coffee in her hand, I needed that, of all the days to be in shorts and trainers stood in the frozen undergrowth, I was feeling the cold by now, my toes were freezing. I agreed to leave Pete and we exchanged contact details so I could find out what happened, I walked back to Church with Jo, but then I got a phone call from a guy called Brian from the Lincolnshire Deer Group, he said he was on his way, he was only about ten minutes away, but did state that he had been sent to “despatch” the deer. He stated if it couldn’t be safely freed, he would have to put it down, this I didn’t want, I wanted the deer freed, so I went back and waited with Pete. Brian arrived and assessed the deer, he had a small jack in his van, he covered the deer’s head and tried to use the jack to open up the bars. A jack is made to lift cars when there is a flat tire, it wasn’t suited to the bars, but he made it work, the bars slowly opened, then he reached down and lifted the small deer’s back end up and out the bars, no sooner had it’s back legs hit the ground, it lifted itself up and bolted off over the road heading for the open fields from which it had come. Brian felt that it should be okay now, if there was any serious injury it would have collapsed there in front of us. The fur patches on it’s back will grow back, maybe not until it’s shed it winter coat, but probably with the new summer coat. Now it was up to nature to look after this little deer, we had done all we could for it. By the time I got to Church the service had started, someone had set up the camera for me and I took over after I had cleaned up. I’ve never been late for Church before, but I was happy being late for this reason. I am sure there is some reason why it was me who found this deer yesterday morning, there is some lesson I am to learn from it. I could have walked on by, it wasn’t my problem, I could have made the call to the RSPCA and then left, but I felt the need to wait until I knew it was being looked after and not left alone, after all it was a tiny animal in a helpless situation, it needed my help. This animal is as much a part of creation as I am, I wasn’t meant to cross over to the other side of the road, to just pass on by, but if I can stop and help to save a small deer, am I willing to stop and help other people when they are trapped and helpless, just like someone helped me. This entry was posted in Faith, Ramblings and tagged Christ, Church, Creation's Call, Deer, Faith, Freedom, Friends, God, Grace, Hope, Inspiration, Jesus, Love, Mercy, Peace, Something Like Silas on January 30, 2017 by waynemali.